You are here: Home / Decorating / Kitchen Update…Home Stretch! I wanted to give y’all an update on our kitchen renovation. We’ve had some hiccups along the way (as you might have already read in this post about me losing my mind), but now we’re in the home stretch and I am getting really excited about it finally being done. New cabinets are in. Countertops are not, but allegedly are coming THIS FRIDAY (yay! knock wood!). There is now a shelf between the windows, rather than a big honkin’ cabinet. The cabinet that was there before blocked the light coming into the kitchen from the windows. The shelf – soon to be shelves (only one is up now; there will be two or three) – lets the light flood the kitchen – it’s awesome. I love it, and I have visions of cookbooks and pretty mixing bowls on those shelves. You might see that the shelf has a ledge underneath it. That is just a trim piece, to hide the electrical outlets and under-shelf lighting that will be installed there. That’s one thing I might never have thought of that our brilliant contractors thought of – using under-cabinet lighting and putting the electrical outlets under the cabinets. That way, they are hidden and they don’t break up the beautiful glass and stone mosaic tile backsplash that will be installed (next Tuesday). Here’s another view of the shelf and windows. 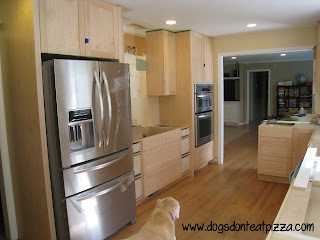 Also, you can see our new dishwasher (yay!) and the paint color, which is Benjamin Moore’s Sesame in Natura (zero VOC). 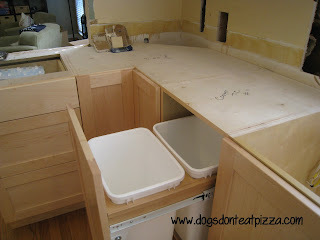 For the dishwasher, Craig, our fabulous contractor, hooked it up even without the countertops, so we can use it now. We’ve already run it. It was a beautiful thing. Waaaaaay better than washing dishes in the bathroom sink. Moving down that wall, on the other side of the sink area, you will now see one of the GREATEST features of our new kitchen: the double trash bin/recycling bin pull out cabinet. Right there. In the kitchen. This is life-changing, people. 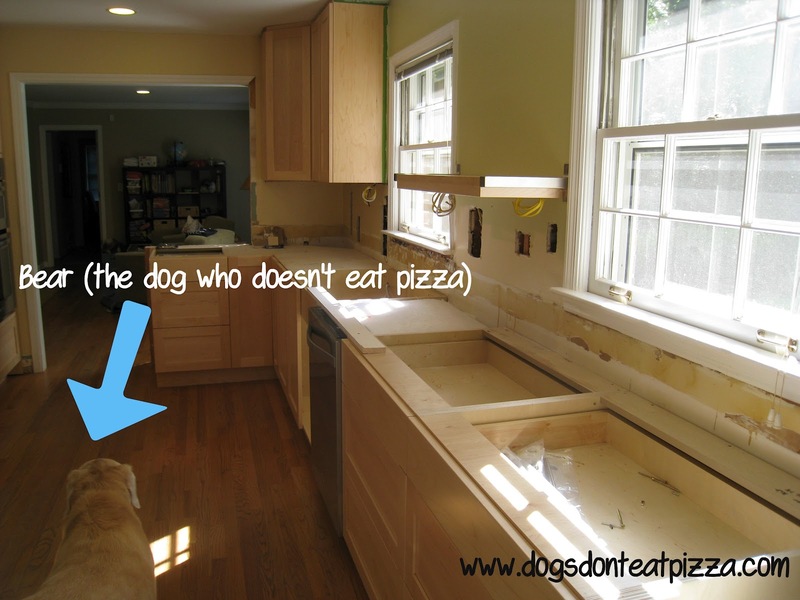 Before, we had no place for recycling in the kitchen. So, every time I wanted to put something in the recycling bin (and I recycle pretty much everything), I would either (a) pile it up on our counter until there was a critical mass that required a trip outside to the recycling bin; or (b) take out the recyclables one by one, as needed, outside to the recycling bin. Now, we can put a recycling bag (we have special bags for our recycling pick up) in one of those bins and it’s right there. We just have to take it out when it’s full. Life-changing, people, I tell ya. Continuing our 360 degree tour, this is what will become the peninsula/giant work space. There will be an overhang on the other (living room) side with stools. And there’s Hank. He approves. And is tired. 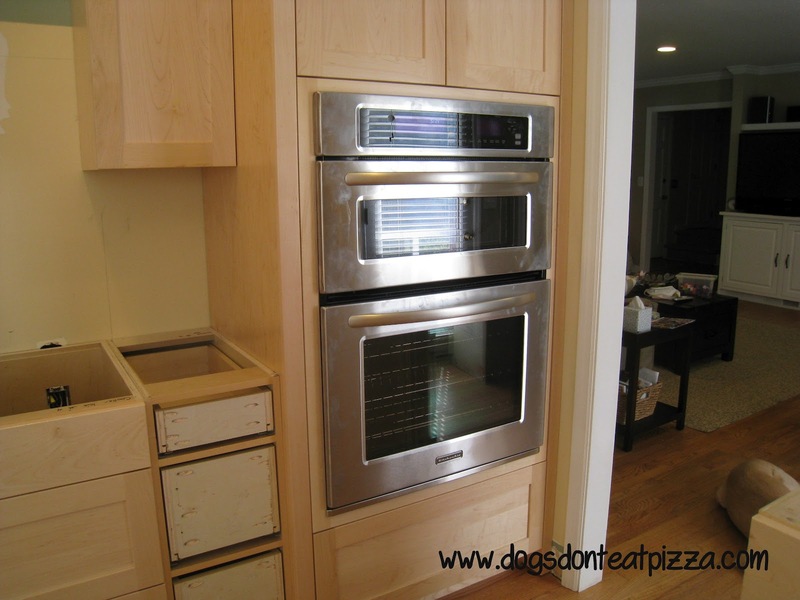 Double ovens. Need I say more? They had me at convection. I’ve already made biscuits (refrigerated, pre-made, but still) in the lower oven and popcorn in the upper one, which is a microwave/convection combination oven. No more ugly microwave on the counter. It’s a beautiful – and space efficient – thing. The rest of that side of the kitchen… The cooktop will go where that big empty space is, with drawers underneath for pots and pans. And there is the fridge, which is gorgeous, but will be replaced soon with one that doesn’t make a weird noise (knock wood again!). The cabinets are custom-made and gorgeous. They did an amazing, beautiful job. They are maple – perfect color, exactly what I wanted. Just beautiful. So, that’s the update! The schedule going forward is that, from now until Friday, the rest of the walls get painted, the trim gets sanded/repaired and painted, and the handles go on the cabinets. Then Friday the countertops arrive! 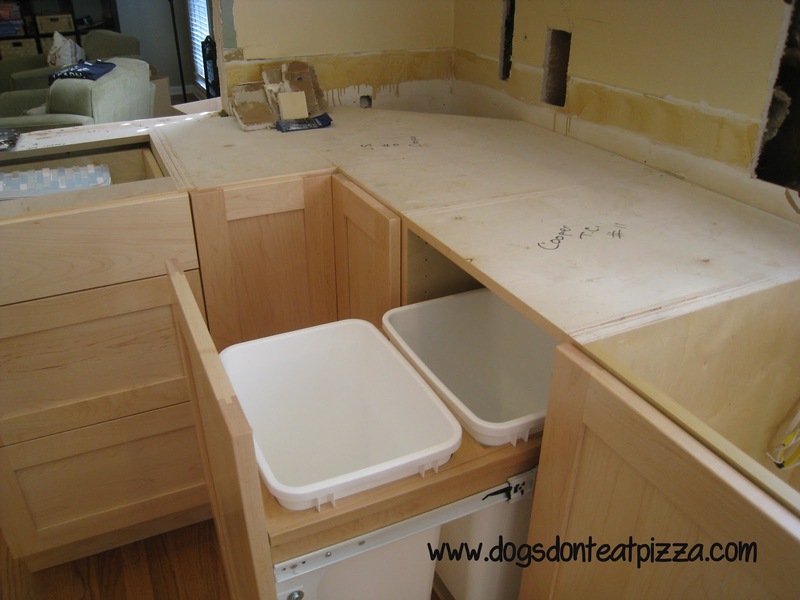 When the countertops are installed, the sink and cooktop will go in as well. Then we’re really near the finish line. Tile on Tuesday of next week, then the ventahood and finishing touches on Wednesday. 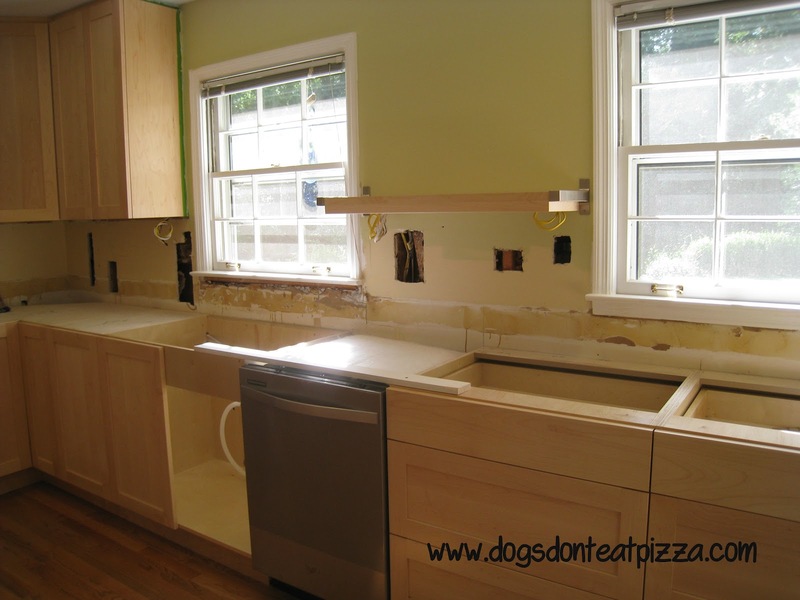 This has been a process for sure, but our amazing contractors, especially Craig Reising, have gone out of their/his way to make as little mess as possible and ensure we have as much use of our kitchen as we could. Craig especially knows how much this means to me and how much I love cooking, and that makes it even more special. I think he’s going to get caramel squares when this is all done. I can’t wait to make them. I still can’t believe I’m going to get this gorgeous kitchen. It’s just amazing. I’m pinching myself. So grateful and excited. Thank you! I can’t wait for it to be done! I would never have thought about substituting a shelf for the cabinet between the windows. Clever. I also wouldn’t have thought a cabinet would block so much light, but what do I know? I see a light at the end of the kitchen tunnel. We actually had a cabinet there in our old kitchen and for a week or so after due to a mistake with our new cabinets. It was amazing how much of a difference it made to remove it. It’s so much brighter. 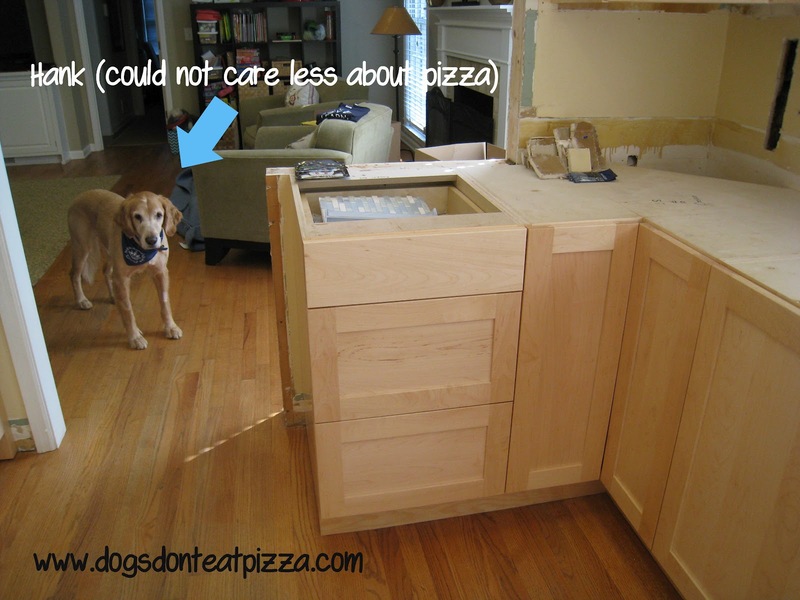 Plus, now that we have big, deep drawers for dishes, we don’t need the cabinet there, which held those dishes. Instead, I can put stuff there I want to display or reach easily. Hi Karen! Thank you for linking up with us for the Southern Mama’s blog hop! Thanks, Megan! Thank you for hosting it! Here’s to washing dishes in the kitchen – because the bathroom is so overrated! Love the open shelf – great for displaying. I hugged my contractor when he told me the sink would be in and working by the weekend. I have a thing about bringing food or drink in the bathroom anyway, so the whole washing dishes in the bathroom has rattled me a bit. Home stretch! Thanks!